Catlin is getting some federal help for a $10.3-million dollar renovation of the community’s wastewater treatment plant. 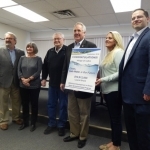 Congressman John Shimkus and Doug Wilson – the Illinois Director of the USDA Rural Development Program – stopped by Catlin city hall Thursday afternoon to discuss the new financial agreement. [Note: You can click on the photo to enlarge it.] Catlin is getting a federal grant of $2-million dollars. The remaining cost of over $8-million dollars will come from a low-interest USDA loan. The 2100 residents of the community will pay-off the loan over a 30 year period. 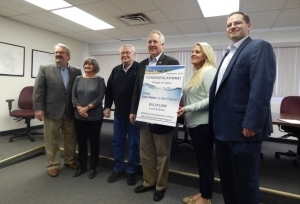 Wilson noted that Illinois communities with a population of 50,000 or less can get help from a number of programs offered through the USDA Rural Development Program.